According to curators at the NRA’s National Firearms Museum—where the gun has found a most comfortable home—markings recorded on both the barrel and lockplate demonstrate a connection with the Beretta family of armorers. One of the features making this musket instantly recognizable is its namesake. The surviving detail of the actual wheel-lock device—the rotating mechanism, which provides spark and ignition, not unlike that of our modern day cigarette lighters—is a thing of fine craftsmanship and beauty. The wheel-lock’s engineering, execution and efficacy far exceed those of its predecessor, the matchlock. Without the adventuresome spirit of one young man with an eye for quality arms, the Mayflower Gun would not be a part of our American history today. Enter, John Alden. Alden was around 20 to 21 years of age at the ship’s departure. However, his original intent was never really to set sail. He was simply hired as a ships cooper—a barrel maker by trade—at the yard where ships docked. But being a young man with much hope and courage, he decided to board the Mayflower for its daunting passage. Sometime near debarkation, it is speculated that Alden purchased the firearm used, perhaps from a traveler or mercenary as was common in those days. Of the guns widely available at that time, this was one of the finest and most expensive, so certainly young Alden was wise beyond his years. Following an arduous three-month winter passage at sea, battered by the north Atlantic’s gales, the Mayflower reached its destination in 1620. History recognizes John Alden as the first man to step ashore, and when Alden’s feet hit terra firma, this gun was most likely his sole means of protection. Though the early years at the new settlement were marked with many tribulations, Alden prospered. Along with the other men who made the passage, he was one of the signatories of the Mayflower Compact, documenting the freedoms and liberties of the new colony. Among his many ventures, Alden is remembered for his service under Capt. Miles Standish, with whom he is rumored to rivaled over the courtship of the woman who eventually became Alden’s wife. Part of this story is recounted in Longfellow’s poem “The Courtship of Miles Standish.” Between the years 1633 to 1675, Alden served not only as assistant governor of the Plymouth Colony, but often, due to absence, fulfilled governor duties. He was known to have served on many juries including participation in at least one witch trial. Through all this time, including a move inland and away from the original colony, the Mayflower Gun remained in Alden’s possession. At the time of his death in 1687, the gun began its long succession of Alden family ownership. The Alden family dwelling, like the gun, has survived for nearly 400 years. 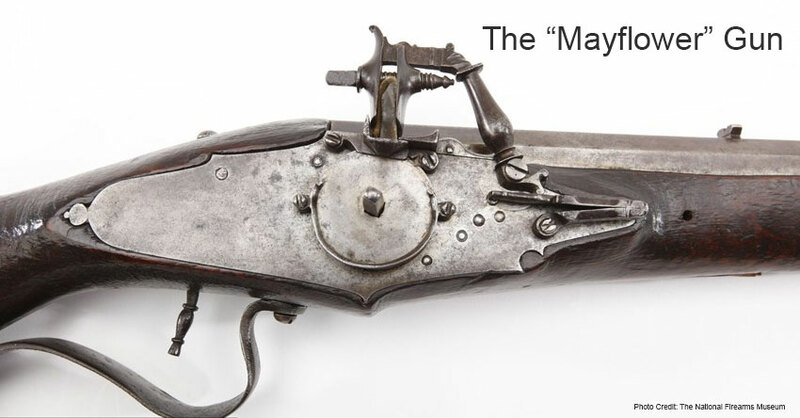 The Mayflower gun was discovered—still loaded, nonetheless—in a secret protective cubbyhole near the front door of the home during a 1924 renovation. The Alden home, which was occupied by family members until the mid-1890’s, is currently a National Historic Landmark in Duxbury, Massachusetts. Though it is certain that other settlers would have carried similar arms, this is indeed the only known surviving piece, likely because it was tucked away and forgotten after its years of service had ended. Because the gun was something of a large caliber at the time, it would likely have been used to take down deer and other large game as well as birds—perhaps even a Thanksgiving longbeard. Naturally, the original stock was fashioned of fine European walnut, though sometime in the gun’s history, a worn portion of the front stock was replaced with American walnut. There is great beauty in the wear patterns of the wood, simply for knowing the many hands and circumstances that have handled this weapon. Oh, the stories it could tell of game hunted, lives taken and families saved! This tool was at once a protector and a provider. In fact, the Mayflower Gun may well have been present—or at least played a role—at the 1621 birth of the Thanksgiving holiday we celebrate today. The gun, in fact, is one of the few surviving pieces known to have made the trip aboard the Mayflower. Those near Fairfax, Virginia can visit this amazing and well-traveled weapon at its home in the NRA’s National Firearms Museum. It is currently being featured on display as part of the “Old Guns in a New World” gallery, an exhibit in which firearms bridge the gap between the Old World and the new colonies. In addition to this one, the Museum is home to 14 other galleries housing more than 2,700 firearms of remarkable significance. Admission is free and the museum is open daily. For those interested in learning more without making a physical visit, detailed virtual tours are easily navigated at their website. Nearly 400 years have passed since the Mayflower Gun traversed the Atlantic to forever become a priceless, tangible slice of American history. In the spirit of Thanksgiving celebration, the time is right to remember not only all those who came before us, but also the hardships they faced to get us where we are today. In reminiscing on this beautiful Mayflower Gun, we here at Guns.com are thankful for our first amendment freedoms. So with a nod of the clichéd black pilgrim hats, take some special time this holiday to enjoy family, friends, freedoms and of course, firearms.